the ground is white. the sky is chartreuse. 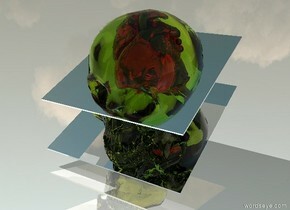 there is a clear cyan skull 1 feet above the ground. 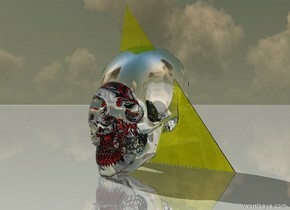 there is a 7 inches tall white pyramid 6 inches in the clear cyan skull. 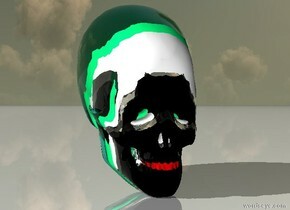 there is a 9 inches tall clear black skull 7 inches in the clear cyan skull. 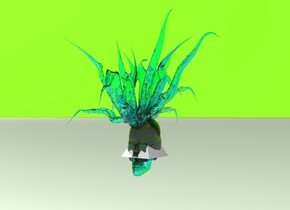 there is a translucent cyan aloe plant 2 inches in the clear black skull. there is a 3 feet tall red skull 1 feet above the ground. 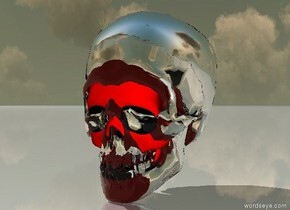 there is a 3 feet tall silver skull -22 inches behind the red skull. its tooth is black. 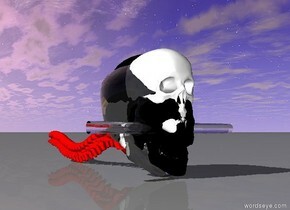 there is a 3.4 feet tall black skull -43 inches behind the silver skull. it leans south. 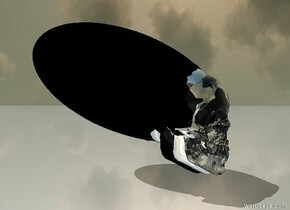 the first black sphere is 5 feet tall 3 feet wide and 20 feet deep. 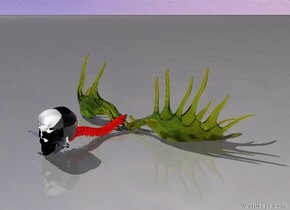 the first sphere is -47 inches behind the black skull. it leans south. the ground is shiny. there is a six feet tall clear skull 15 inches in the ground. its tooth is aqua. its cranium is aqua. it leans north. a 10 feet tall clear aqua irish elk is seven feet in the clear skull. it is -5 feet behind the clear skull. a first flat clear chartreuse rectangle is 6 feet in the irish elk. it is 15 feet long. it is six feet tall. it faces west. the ground is shiny. a flat silver rectangle is three feet in the first chartreuse rectangle. it is 15 feet long. it is six feet tall. it faces up. it faces west. there is a 6 feet tall clear chartreuse skull. the first 8 feet long red cylinder is 2.5 feet in the skull. it faces up. the first 8 feet tall flat silver cube is -24 inches left of the skull. it faces west. it leans north. 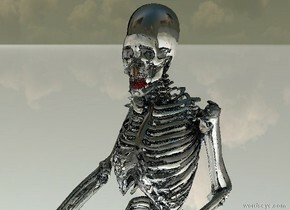 the second 8 feet tall flat silver cube is -24 inches right of the skull. it faces west. it leans south. the ground is shiny. there is a clear 2 feet tall sphere. a 1.2 feet tall clear spring green brain is 1.7 feet in it. the ground is shiny red. 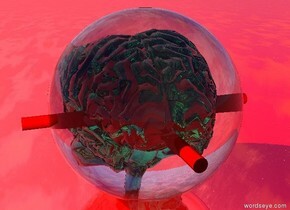 a 1st tiny red 2.5 feet long cylinder is 8 inches in the brain. it faces up. a 2nd tiny red 2.5 feet long cylinder is 1 inches in the 1st red cylinder. it faces up. it faces east. the first clear pyramid is upside down. the 2nd clear pyramid is on it. the sky is spring green. the ground is fern green. an eight inch tall silver sphere is 16 inches in the 2nd clear pyramid. the bright blue light is 4 inches above the 2nd clear pyramid. a clear lime wall is left of the first clear pyramid. it is twelve inches tall and 500 feet long. it faces left. a third clear pyramid is 25 feet behind the first clear pyramid. it is upside down. the 4th clear pyramid is on it. a nine inch tall silver sphere is 16 inches in the 4th clear pyramid. a bright yellow light is 4 inches above the 4th clear pyramid. a clear red wall is above the clear lime wall. 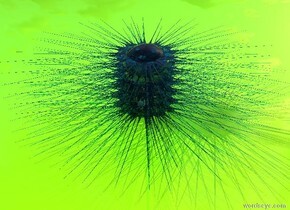 it is 2 inches tall and 500 feet long. its top is clear red. it faces left. its bottom is clear red. there is a clear hot pink skull. 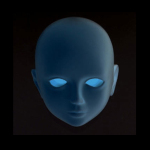 there is a 1st flat clear aqua sun symbol 11 inches in the skull. it faces up. 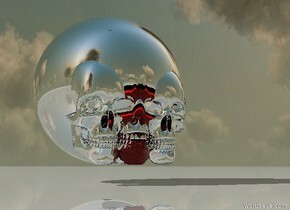 there is a 2nd flat clear aqua sun symbol 9 inches in the skull. it faces up. 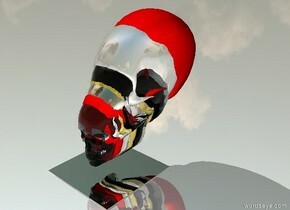 there is a 3rd flat clear aqua sun symbol 7 inches in the skull. it faces up. 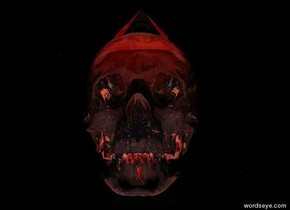 there is a 4th flat clear aqua sun symbol 5 inches in the skull. it faces up. 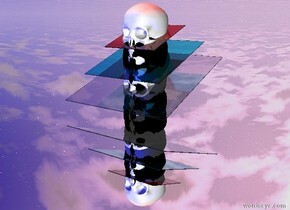 there is a 5th flat clear aqua sun symbol 3 inches in the skull. it faces up. 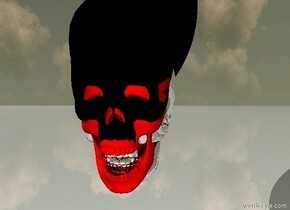 there is a 6th flat clear aqua sun symbol 1 inches in the skull. it faces up. the ground is shiny chartreuse. there is a clear rainbow. there is a clear azure rainbow above the clear rainbow. it is 51 feet in it. it faces west. the ground is 300 feet wide shiny rainbow. 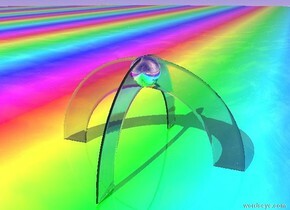 there is a 15 feet tall silver sphere 15 feet in the clear azure rainbow. there is a clear cave. it is upside down. there is a clear azure cave 12 inches in it. there is a clear dodger blue sun symbol 3 feet above the ground. there is a 3 feet tall clear azure sphere 3.4 feet in the sun symbol. the ground is gentle blue. 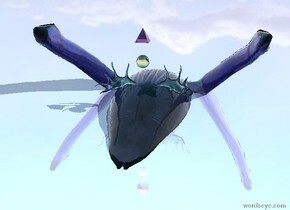 there is a five feet tall clear delft blue flat torus four feet in the clear azure sphere. the sky is white. the ground is shiny azure. there is a white skull 5 inches in the ground. it leans west. 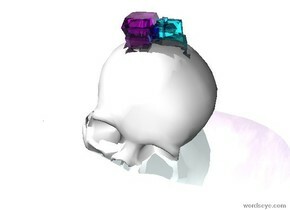 there is a 4 inches tall clear purple crystal 1 inches in the skull. there is a 4 inches tall clear aqua crystal -2 inches right of the clear purple crystal. the ground is unreflective violet. there is a large clear rock 6 inches in the ground. there is a large clear pink rock 17 inches in the clear rock. there is a 2 feet tall clear purple crystal 12 inches in the large clear pink rock. 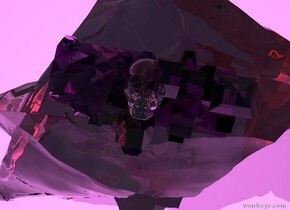 there is a clear skull 2 inches in the purple crystal. it faces up. the ground is silver. the sky is tiny stripe. there is a tiny clear red city block 3 feet in the valley. there is a tiny clear hot pink city block above the clear red city block. it is upside down. the ground is shiny hydrangea blue. there is a clear wisteria violet humpback whale. it is upside down. it is 6 feet in the ground. there is a clear acid green irish elk 10.5 feet in the humpback whale. 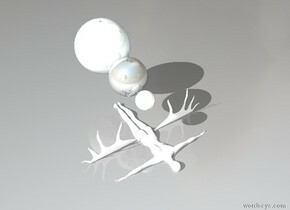 there is a clear primrose yellow sphere above the irish elk.there is a clear hot pink pyramid 1 feet above the sphere. the first clear red star is 2 feet in the ground. the ground is shiny hot pink. the second clear red star is 3 feet in the first clear star. the third clear red star is 3 feet in the second clear star. 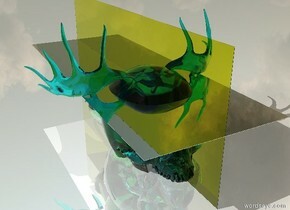 there is a clear skull 1.8 feet in the third clear star. the ground is shiny white. there is a 2 feet tall clear copper sphere 1 feet in the ground. there is a 1.5 feet tall clear red sphere 6 inches in the copper sphere. there is a 7 inches tall clear sphere -4 inches in front of the clear red sphere. 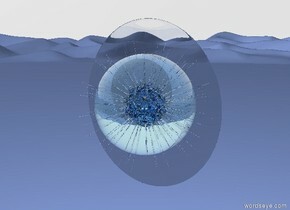 there is a 3 inches tall clear cyan sphere -2 inches right of the clear sphere. there is a 1.5 feet tall clear marmalade sphere -5 inches left of the copper sphere. there is a 1 feet tall clear olive sphere 7 inches in the marmalade sphere. there is a 1 feet tall clear hot pink sphere -5 inches right of the olive sphere. 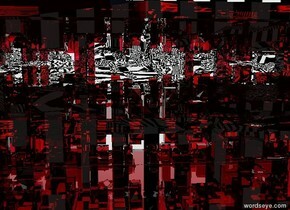 there is a clear skull 1.2 feet in the red sphere. the ground is silver. there is a cyan condor 1 feet in the ground. 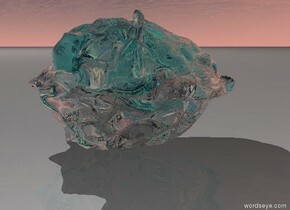 there is a 25 inches tall cyan sphere 7 inches in the condor. 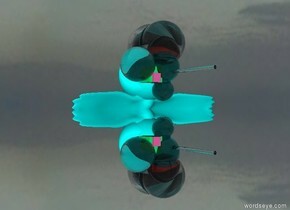 there is a cyan plumage -3 inches left of the sphere. it faces down. a 10 inches tall clear sphere is -5 inches in front of the cyan sphere. a 15 inches tall clear cyan sphere is 2 inches in the clear sphere. 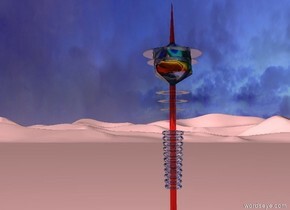 a 15 inches tall clear red sphere is -7 inches behind the cyan sphere. a 13 inches tall clear sphere is 5 inches in it. 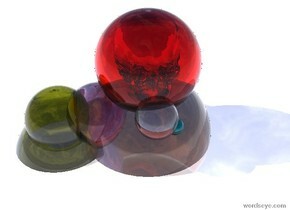 a 22 inches tall clear sphere is 9 inches in the red sphere. a 12 inches tall clear red sphere is 7 inches in the cyan sphere. a 20 inches tall clear sphere is 12 inches in the clear red sphere. a tiny clear 60 inches long cylinder is 11 inches in the cyan sphere. it faces up. 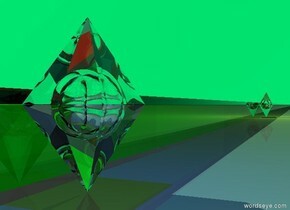 there is a 7 inches tall spring green cube -4 inches left of the cyan sphere. there is a 4 inches tall hot pink cube -3 inches in front of it. 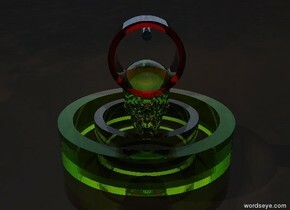 there is a 15 inches tall clear sphere -4 inches left of the spring green cube. 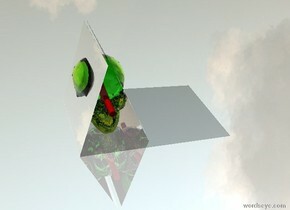 there is a first clear green flat cube 2 inches above the ground. it faces up. 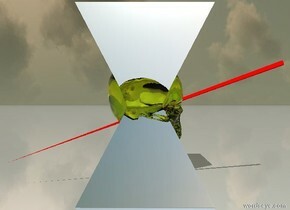 there is a second clear flat green cube 2 inches above the first clear green flat cube. it faces up. the second clear green flat cube is -10 inches north of the first clear green flat cube. 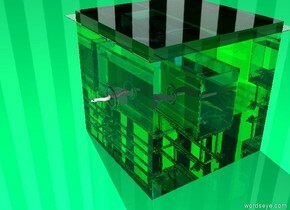 there is a third clear flat green cube 2 inches above the second clear green flat cube. it faces up. the third clear green flat cube is -10 inches north of the second clear green flat cube. 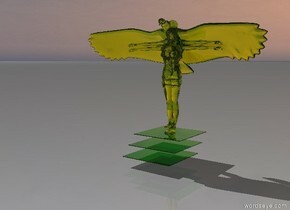 there is a first 2 feet tall clear chartreuse woman on the third clear green flat cube. she faces south. there is a second 2 feet tall clear chartreuse woman 1.9 feet in the first 2 feet tall clear chartreuse woman. there is a 1 feet tall clear chartreuse andean condor 1 feet in her. the ground is spring green. there is a 1st clear construction site. it faces up. there is a 2nd clear construction site 50 feet in the 1st clear construction site. there is a third clear construction site 25 feet in the 2nd clear construction site. 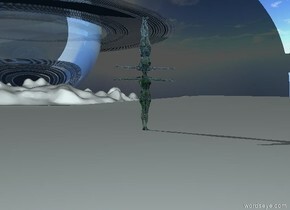 it leans left.there is a 100 feet tall translucent cyan sphere above the clear construction site. it is 10 feet in the construction site. 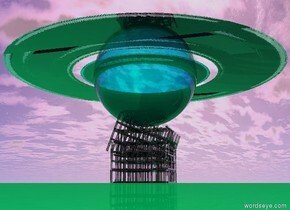 there is a 125 feet tall clear spring green flat torus 50 feet in the sphere. it faces up. 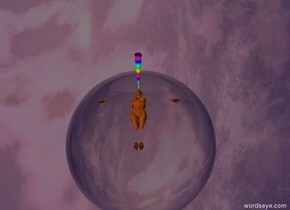 there is a 260 feet tall flat clear torus 49 feet in the sphere. it faces up. the ground is shiny gray. 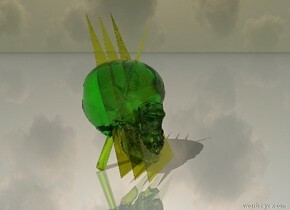 there is a 5 feet tall clear chartreuse skull. 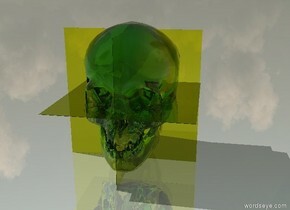 the first 5 feet tall clear chartreuse flat cube is 5 feet in the skull. it faces west. the second 5 feet tall clear chartreuse flat cube is 5 feet in the first 5 feet tall clear chartreuse flat cube. the third 5 feet tall clear chartreuse flat cube is 2.5 feet in the second 5 feet tall clear chartreuse flat cube. it faces up.